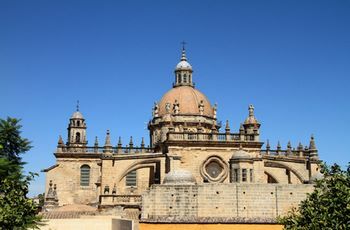 Compare prices from several car hire companies in Jerez and find the best price for car rental. Our prices always include unlimited mileage and insurance. Jerez de la Frontera is situated in southeast Spain, about 15 km from the south coast and the Atlantic Ocean. It is approx. 30 km to the Portuguese border and its population is measured at over 200 000 (2008). Jerez de la Frontera is famous for the production of sherry and brandy, in addition to the breeding of horses with English, Arabic and Spanish blood, called Andalusian horses. In May it held a horse market, while the grand Easter celebration is known throughout the country. The city is considered the birthplace of flamenco, and you can learn more about this dance of Andalusian Centre of Flamenco. Jerez Airport is an international and modern airport which is also called La Parra Airport. It is located approx. 8 km outside the city center.